Dad. Did you know... It's estimated that Bank of Dad will write off £20,000 in unpaid loans during teen and student years. See, not all banks are bad. Dad. 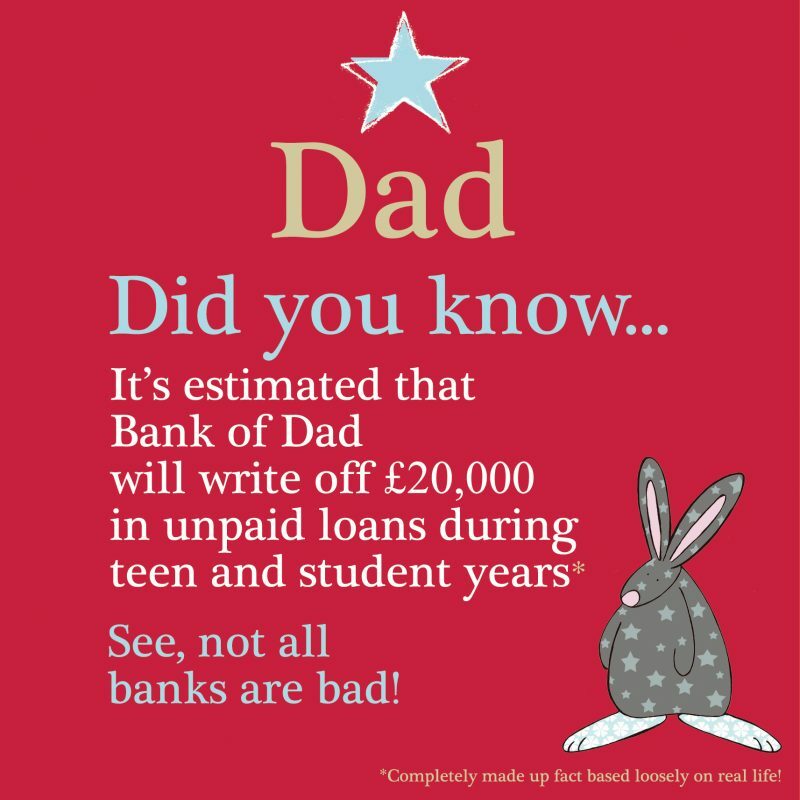 Did you know… It’s estimated that Bank of Dad will write off £20,000 in unpaid loans during teen and student years. See, not all banks are bad. Anna Danielle studied printed textiles at Winchester School of Art. Her final degree work featured cows, lots and lots of cows. Each student was required to have a quote or sentence that best described their work. As Anna’s artwork has always been animal based, simple and full of gentle humour and being in a bovine frame of mind she chose the line from the Over the Moon nursery rhyme “the little dog laughed to see such fun” which later became her final choice of company name. Whilst studying for her textile degree, Anna had her first experience of designing greeting cards. That was her eureka moment and 18 years on she is still creating cards and gifts. She primarily works with watercolour and pen. Card size : 145mm x 145mm or in old money 6″ x 6″. Printed on FSC board (forestry sustainable card stock to you and me) here in the UK, have a white envelope and arrive cello wrapped for protection. All Rufus Rabbit cards are left blank inside for your own message. Want to join the bunny club? Before Rufus entered our working lives, we were and still are consumed by all things dog and cat. Greeting cards are our thing, and when it's not all about the rabbit then it's all about "the little dog laughed". Both brands are the creation of greeting card designer Anna Danielle and her business partners and brothers, Gavin and Nathan.